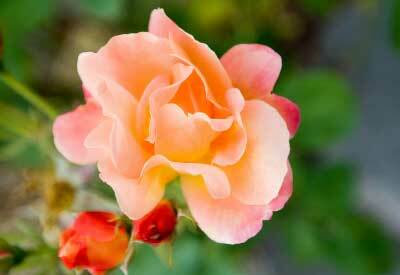 Learn how to plant, grow and care for roses using these proven, organic techniques. Roses are one of the most popular plants in flower gardens and landscapes. From delicate tea roses to voluptuous Grandiflora blooms, roses delight all the senses. Roses also have a reputation for being difficult to grow. But like anything, rose gardening is easy… if you know the tips and tricks of the trade. With the right gardening products growing organically ​is ​​easy! At Planet Natural we stock everything you need ​to guarantee your prize-winning roses are the envy of the neighborhood! Before planting your rose garden take some time to determine the best site. If possible, check out the site at different times during the day and different times during the year. Find a place with rich, well-drained soil. If this doesn’t sound like any spot in your yard, amend the soil with compost before planting. Roses prefer slightly acidic soil (6.0-6.5 pH is best). Don’t know your soil’s pH? Get a pH test kit and find out. Be sure your rose site will get plenty of water. 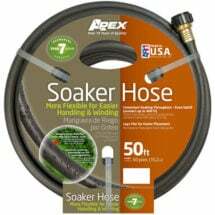 Plan to install a drip irrigation system or use a garden hose to water regularly (see Drip Irrigation for Home Gardens, PDF). Roses need at least 8-10 hours of sun a day, so choose a site away from shade-inducing trees or houses. If you have to pick, morning sun is better than afternoon sun as it will dry the dew that encourages fungus. Imagine your roses as mature plants. Then, make sure your site will have enough room for each plant without being cramped. More on site selection and bed preparation here. There are several factors to consider when choosing the perfect rose for you. Do you want a rose that is easy to grow? Check with your cooperative extension service to find out what varieties are best suited for your area. Depending on local soil type, climate, etc., some roses will be hardier in a particular area than others. Choose a less persnickety variety — some roses are easier to grow than others. Ask a Master Gardener or check with your local nursery. Climbers: City of York, Clair Matin, Dublin Bay, New Dawn and Royal Sunset. Floribundas: Anabell, Bridal White, Iceberg, Little Darling and Simplicity. Grandifloras: About Face, Double Delight, Gold Medal, Prima Donna and Queen Elizabeth. Heritage: Apothecary’s Rose, Celsiana, Charles de Mills, Nastarana and Souvenir de la Malmaison. Hybrid Teas: Dainty Bess, Irish Elegance, Marijke Koopman, Olympiad and Touch of Class. Miniatures: Beauty Secret, Giggles, Gourmet Popcorn, Holy Toledo and Minnie Pearl. Shrubs: Apple Jack, Dortmund, Eddie’s Crimson, Henry Hudson, Immensee and Surry. Do you want a rose that blooms repeatedly? Rosa rugosa, the sea tomato. Six-foot-tall hybrid Rosa rugosa ‘Hansa’, which has huge, fragrant, purple-pink flowers. Rosa rugosa ‘Scabrosa’ with large single pink flowers. Bigger blooms… naturally! 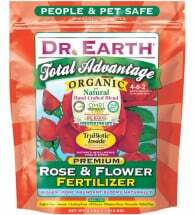 Dr. Earth® Rose & Organic Flower Fertilizer is a handcrafted blend designed for today’s gardener who cares NOT only for the environment in their own backyard, but also for that of the entire planet. Each 4 lb box covers 55 square feet or 80 1-gallon transplants. Are you worried about pests and fungus? The rugosas and hybrid musks mentioned above are resistant to common plant diseases such as black spot, rust and powdery mildew. “Ballerina”, which has pale pink blooms reminiscent of ballet shoes slippers. “Mozart” — a cheerful hybrid musk rose that is reputedly easy to grow. Are you more concerned with size and showiness than ease of care? “Bewitched’s” pearl, pink flowers are very fragrant. The second most widely grown rose in the world, “Queen Elizabeth” is beloved for its huge, pink blooms. “Rouge Royale” holds up in rain and heat, looking lovely all the time. Once you’ve determined where your roses will live and what variety best suits you and your climate, it’s time to get planting. There are several ways to buy roses for your garden, such as bare roots or potted. Some people will prefer to take cuttings from established bushes. And for those who don’t have room in the ground to plant roses, container gardening is a great alternative. The plants will acclimate to your soil more quickly. There are more varieties to choose from. 1. Pick the best time for your climate. Plant roses while they are still dormant, but after the danger of hard frost has passed, usually between December and May, depending on where you live. 2. Keep the roots damp until it’s time to plant them. 3. Dig a large hole and make a cone of rich organic potting soil or compost at the bottom. 4. Add some fertilizer to the cone of soil. 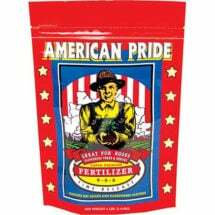 A good organic fertilizer mixture includes bone meal, alfalfa meal and glacial rock dust. 5. Place the plant into the hole and gently fan the roots over the cone of soil and fertilizer. 6. Fill in the hole with a mixture of the native soil and organic compost. When filling the hole, be careful not to bury the grafted portion of the plant. 7. Water immediately to help the plant settle in. Do not add additional fertilizer until you notice new growth on your rose bush. Traditional hand-crafted quality. 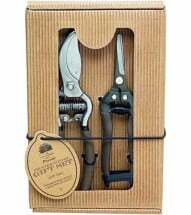 The Flexrake® Classic Pruning Set includes a Bypass Pruner (3/4″ capacity) and Snipper Shear all wrapped up nice and neat in an attractive craft style gift box. Each garden tool measures 8-inches long. Planting potted roses is almost the same as planting bare root plants. First, dig a hole. The size will depend on the container’s size and should provide plenty of room to accommodate both the plant and the amended soil mixture (see How to Plant Potted Roses). Add about four-inches of organic compost, well-aged manure or peat moss. Add fertilizer — a mixture of bone meal, greensand and glacial rock dust works well. Incorporate the compost and the organic fertilizers into the soil. Add the plant (keeping the root ball intact), but be sure that the grafted section, or bud union, of the stem is not buried below the soil. Backfill the hole with a mixture of native soil and the organic compost. Water immediately and don’t add fertilizer until you see new growth. Why is it so tricky? Well, the simple answer is that cuttings lack a root system to take up water and nutrients. So, in order to propagate your shrubs successfully, you must create an environment that will sustain them until they develop enough roots to survive on their own. 1. Choose cuttings from the upper part or the side of a plant that are healthy and representative of the plant — early summer is usually the best time to obtain clippings. 2. Select a stem that is 4 to 6 inches long and has at least 2 or 3 leaves attached. 3. Using a razor blade or sharp pruning shears make a clean slice at a 45° angle to maximize the rooting area. Most cuttings root best if the slice is made just below a leaf node (where branches come out of the stem). 4. Remove flowers, buds and lower leaves from the cutting. Cut the remaining leaves in half to reduce moisture loss. Less foliage will maximize the amount of energy the cutting can expend on developing roots as opposed to maintaining the leaves. 5. 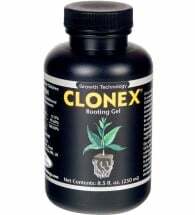 Quickly dip the bottom two inches of the cutting into a cloning solution or rooting gel. Rooting hormone is not always necessary but will greatly improve your success rate. 6. Make a small hole in the growing medium with a pencil. Place the stem in the hole and gently tamp the cutting into place. 7. Cover with a glass jar or put the whole container in a plastic bag to create a greenhouse effect and maintain high humidity levels. 8. Roses root best in bright light. 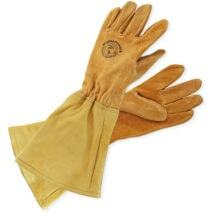 Set them in a window and provide bottom warmth from a heat mat at all times. Avoid overheating the cuttings. 9. Keep the growing media moist and wait until roots appear, usually in as little as three to four weeks. Slowly “harden off” plants before transplanting outside. Visit the Royal Horticultural Society for advice on hardening off your new plants. Choose a rose variety that is naturally compact and a 24-36 inch container to plant it in. Drill 3 or 4 1/2-inch holes in the bottom of the container for drainage if they aren’t there already. Place the plant in the middle of the pot. Fill the remainder of the pot with the soil mix, bringing it level to the top of the rose’s original soil. Watch a video of a rose being planted in a container here. The best time to transplant roses is when mature plants are dormant. That means in the winter or early spring. Transplanting at other times — during the growing season — will really stress your plants. A stressed rose is not a happy rose or one that will bloom freely and often. Start by preparing the transplant site using the same prepping techniques outlined for planting potted roses or bare roots. Prep the plant to be transplanted by pruning the top growth. This will help make the bush easier to handle. Dig a hole large enough to hold the plant’s root system. If some roots are damaged during transplanting, don’t worry about it! Because you pruned the plant’s top growth, fewer roots are required to support it. Be careful to protect the trunk and branches from damage. Injure those parts of the plant and you’ll be inviting fungal disease and insect pests to invade. Water the plant immediately after you transplant it, but do not fertilize until you see signs of new growth. 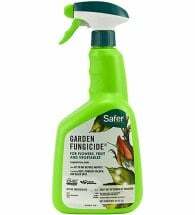 Provides three garden solutions in one: fungicide, insecticide and miticide. 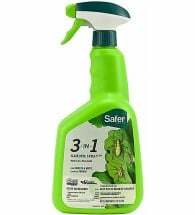 Safer® 3-in-1 Garden Spray contains sulfur and insect killing soap derived from natural fats and plant oils. Kills pests and creates an environment where damaging fungi cannot live. Roses need a fair amount of water. Consider installing a drip irrigation system to ensure consistent watering. A few deep waterings a week are better than light waterings and will encourage your roses to grow deeper roots. Additionally, mulching (see below) will help keep the soil moist. How much water do roses need? Check here. 2. Make pruning cuts at a 45° angle. i. Large branches in the center of the shrub. 4. 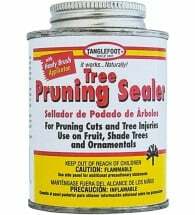 Seal cuts with a pruning paste to prevent disease infestations. 5. Next, prune for appearance. Different types of roses require different pruning techniques. 6. After pruning be sure to rake up any leaves or twigs so they don’t provide a home for insects that might harm your roses. 7. Apply a lime/sulfur spray or Bordeaux mixture of copper and lime to kill any insect eggs that might be lying around. Mulch your rose bushes with 2-4 inches of organic materials such as wood chips, grass, straw, leaves or pine needles. This will help keep weeds from taking root, maintain moisture and aesthetically enhance your garden. Adding too much mulch can keep the soil around your plants too wet and encourage fungal growth, so don’t overdo the mulching. Leave the area around the bush’s stem free of mulch altogether. As mulch decomposes, it ties up nitrogen in the ground, so keep an eye out for yellow or light green leaves which is a sign of nitrogen deficiency. You may need to test the soil and add a nitrogen amendment. Rose plants are heavy feeders and appreciate copious amounts of rose food. For healthy growth and beautiful blooms top-dress plants monthly with a quality organic rose food or apply a liquid bloom fertilizer twice a month as a soil-drench. Do not apply fertilizer after mid-August so as not to encourage new growth that could be easily winter-damaged. Feeds plants for 8 weeks! 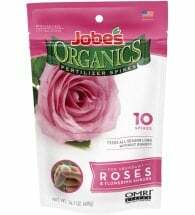 Jobe’s® Fertilizer Spikes for Roses & Flowering Shrubs feeds all season long without runoff! Provides gardeners with a premeasured, slow-release nutrient delivery system that’s effective and safe to use. 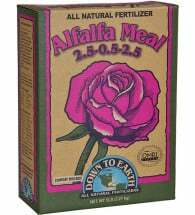 When shopping for a quality rose fertilizer, consider an all-purpose organic blend. Organic fertilizer blends will not burn plants, and because they are derived from many nutrient sources, offer a larger selection of plant nutrition, including nitrogen, phosphorus, potassium, micronutrients, minerals, and vitamins. Also, unlike chemical fertilizers, organic fertilizers will not add toxic salts to the soil that can build up over time. Roses didn’t evolve to grow in cold climes and need extra protection from winter weather. Start thinking about rose cold care long before the snow flies. You want your roses to stop making flowers before the first frost (see Freeze/Frost Maps), which means you need to stop fertilizing in time for the flowers to become hips. Water your plants until the soil freezes. After 2-3 frosts, pile about 8 inches of dirt (from a different location — don’t expose the rose’s roots) around the stem of the plant. Cut longer canes to 2-4 feet and wrap with twine to prevent wind damage. After all danger of frost has past — spring or early summer, depending on your location — remove the insulating material.